While most parents are ecstatic about their kids finding a hobby, such as music lessons, the price of musical instruments can kill that enthusiasm very quickly. Depending on the instrument your child wants to play, it could cost you anywhere from fifty dollars to several thousand. While a great Christmas gift for a child is a musical instrument they can learn to play, you don’t have to break the bank to find them one. Here are some great options to get your kids affordable instruments. Creative Soul’s affiliate Guitarasaur Guitar Store resides at Creative Soul’s school in Watauga, Texas. While Guitarasaur’s main focus is selling instruments, they also allow learning musicians to rent used instruments. The cost for renting averages about $35 per week with the value of the instrument as the deposit, which is refunded when the instrument is returned. The rental fee may change if a student wants to rent a more expensive instrument. If the initial instrument doesn’t work out, the child can swap it for a different one. 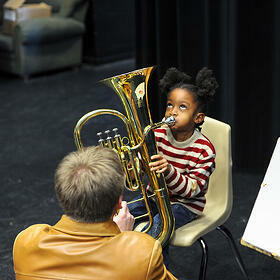 First things first: what instrument does your child want to play? After you know that, you can start asking around to see if anyone has a spare instrument that they would be willing to lend out. Who knows, maybe your next door neighbor is a seasoned music fanatic! A music store can seem like a magical place – there are so many instruments to look at and play! The magic might stop in its tracks after looking at the price tags, though. Sometimes there are far more affordable instruments on online stores such as Amazon, Overstock or Musician’s Friend. Another piece of advice is to buy for the quality of the hobby – not the instrument. Meaning that if your child is just wanting to dabble at playing guitar, start out by getting them a less expensive one. As a love for playing grows, you can “upgrade” in a sense to a better quality instrument. Even after searching an online store, you can still look at secondhand shops! What’s better than an instrument with a rich history, right? A handful of places you can look for a secondhand instrument include sites like Craig’s List, Music Go Round and Hobgoblin Music. 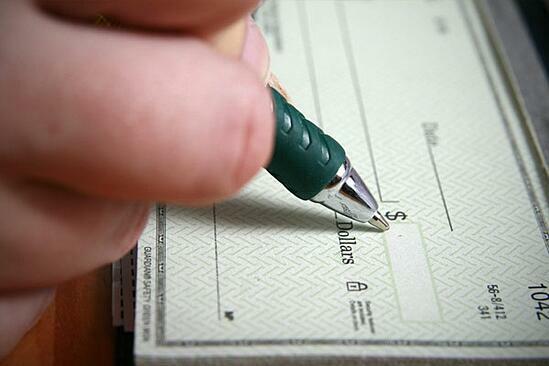 If you can’t afford to pay a large amount up front, you can ask to break up the cost into monthly payments. It’s a great way to encourage your child’s hobby without stressing about the money. What Are the Most Affordable Instruments? Acoustic Guitar – While some guitars can be expensive, you can get some fairly good ones for around $60. Djembe – A Djembe is a wooden hand drum that is easy to transport. You can find simpler models starting out at $20. Electric Keyboards – Start the journey of learning piano with a cheap keyboard – you can probably find one around $50. This is a great instrument for kids as they get the basics of piano down. Harmonica – Simple beginner harmonicas can start around $15-$20. A good quality harmonica (such as a 10-hole diatonic) will be more expensive – around $30-$60. Maracas – Do your kids have a talent for rhythm? Along with other instruments, such as the tambourine or triangle, maracas are fun to play – especially for younger kids. Tin Whistle – Need some Irish culture in your house? The instrument for you is the tin whistle. This little and pleasant whistle can cost under $20. If kids like woodwind instruments, this one is a great affordable instrument. Ukulele – There is no reason not to love the ukulele! It sounds good, is fairly easy to learn and the best part is that they aren’t expensive. Cheap ones are found around $25. Xylophone – Most kids learn the basics of playing the xylophone in elementary school. If they end up loving it, there are tons of xylophone options they can choose from. Your Voice – Your voice is a portable instrument! You’ll never know if you are good at singing if you don’t try. Plus, just like any other instrument, it is possible to improve your singing skills! Just sign up for voice lessons at Creative Soul. Hopefully this has given you some ideas about how to get your kids playing music without the high cost of purchasing an instrument. Plus, if they’re asking Santa for an instrument for Christmas, now you have some affordable instruments to consider! Which option was the most helpful to you? Let us know in the comments!